It’s no secret that I am a huge proponent of anything Spanish. 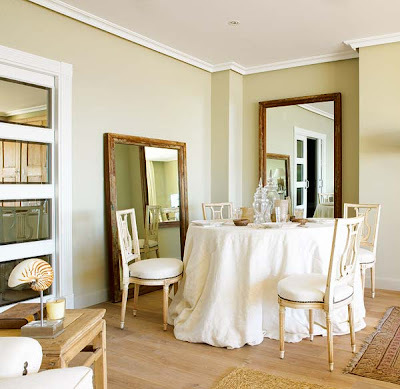 The culture of Spain and its people is beautiful in every single facet and interior design is no exception. 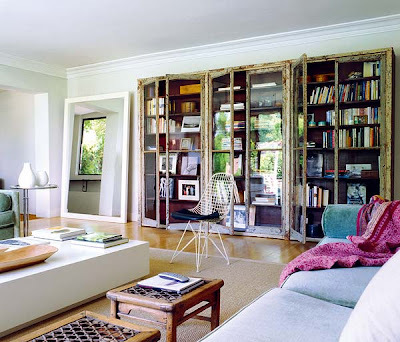 While the Spanish revel in all styles, I have found that their interiors are most often either A. very eclectic feeling as if they have been collected and carefully curated over time or B. they are sleek and modern. Enter the aptly named Nuevo Estilo Magazine, which translates to “new style”. If Domino and Elle Décor had ever had a love child, it would have been this publication. It features incredibly chic interiors which often include an eclectic spin. You’ll find gilded antiques and Bertoia chairs in the same room and they do more than make it work, they make it look fabulous! They excel at blending together so many differing styles, yet they never fight against each other. Instead, they seem to balance each other out. The Spanish have succeeded in their approach of taking the best from multiple influences (just as their ancestors did with Roman, Moorish, Jewish, and Christian influences) and making them work together in creating a unique design identity.These Spanish interiors are among my favorite from Nuevo Estilo as they are a reflection of the way stylish Spaniards live and they exude the same vivacity and warmth as the people. The matador or bullfighter and flamenco dancer are images that are often conjured up when one thinks of Spain. 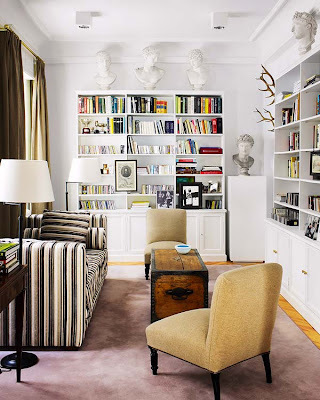 The use of busts and antlers along with the shelving in this room are quite reminiscent of Domino. I love the use of symmetry in this glamorous room. I absolutely adore the shape and color of this sofa. 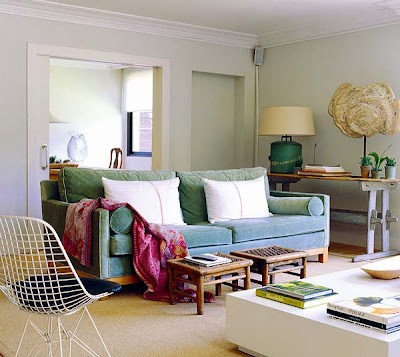 Notice the use of green throughout the room along with the industrial console and vintage Bertoia chair. This rust colored sofa looks very similar to the green one in the previous picture. I like that they have played up the height of the space. Notice the beautiful chevron floors. Another classically beautiful room. This one is by Marino, Cassinello, & Isa features items from many different styles, but they blend together quite well. I especially love the chandelier, gothic mirror that looks like it may have been made from an antique window frame, and the beautiful rustic console. The floors aren’t too shabby, either! I wouldn’t say that the furniture or art in this room are my favorite, per sé, but I so love the white-washed floors and the gorgeous and enormous gilded gold mirror in the background. This room is at once relaxed and elegant. The vibe is eclectic, kitschy, and vibrant. I would imagine that the person living in this home would have a bold personality and a passion for the arts. 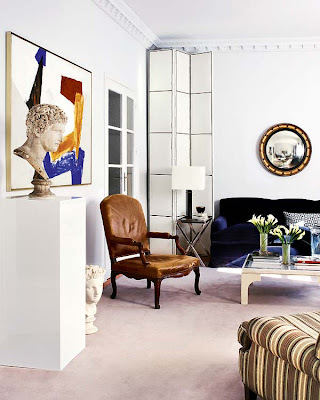 The overall neutrality of the room is balanced out by bold colors in the furniture and art. A beautifully-done neutral room…all that’s missing is a beautiful chandelier. I love the dining table and chairs used here. This room feels so classically elegant. This is beyond cool! The vintage industrial-looking shelving unit is actually a display case from an old pharmacy. 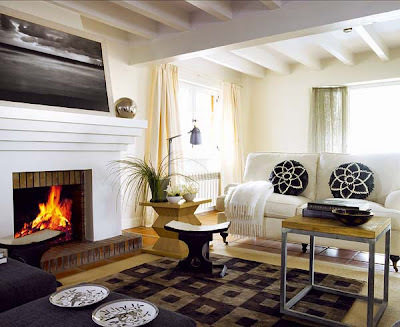 I love that this room, despite it’s dominant cozy cottage vibe, manages to infuse a little modernity through the use of a very stylish mantle and modern occasional tables. A variety of styles come together beautifully in this flat. 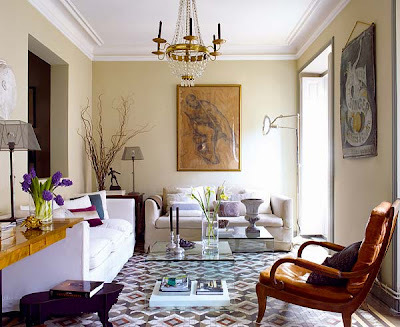 This room exudes effortless elegance through the juxtaposition of antiques and modern furniture. How do I love thee? Let me count the ways. 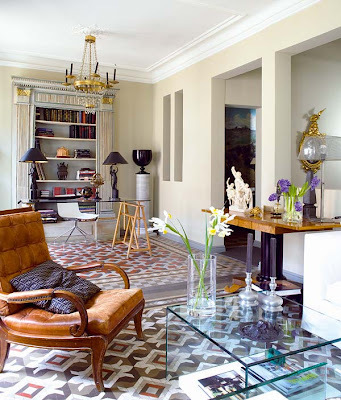 Let’s see, there’s the cool glass coffee table, to-die-for floors (seriously, how gorgeous are they? ), modern sawhorse desk, Parisian flea market chandelier, industrial-looking table lamp on the right, convex federal style mirror, and gorgeous cognac colored leather chair with the most beautiful patina. Wow! Those bullfighter and flamenco chairs are totally crazy! Never seen anything like it, it’s great. Wow! I may have to subscribe….and your love child theory may just have merit….and what better place to have a secret love child than Spain?! Thanks for the beautiful images. They are wonderful! I love the cleanliness of all the rooms. They are all so inviting and fresh. thanks for the great post! Thanks for all of the sweet compliments! I am so glad you enjoyed this post! Loving this post. Inspiration from my parents homeland. 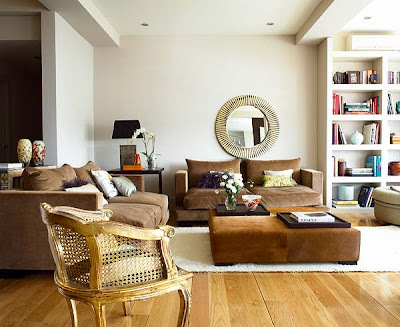 Wow, there are so many rooms I adore in this post, and Nuevo Estilo looks like a magazine I’d love to see in person!! If this is a reflection of what is seen in Spain, then call me a fan! Gorgeous mix of interiors! 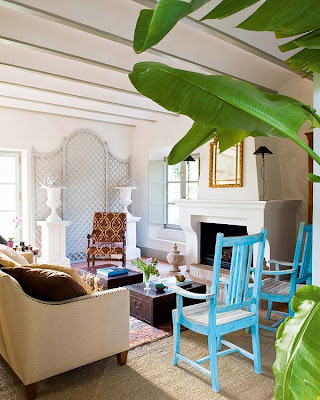 The eclectic blend of furniture is so fun and vibrant. LOVE! 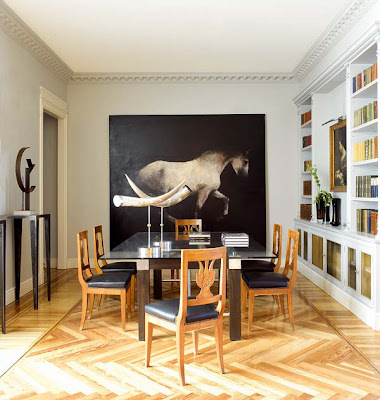 I love the large horse painting – do anyone know who is the artist?